There’s a reason your teachers gave quizzes in school. They’re a great way to test your knowledge and help you memorize what you learn. Granted you probably don’t take many quizzes outside of school. But don’t worry, these art quizzes are actually fun! 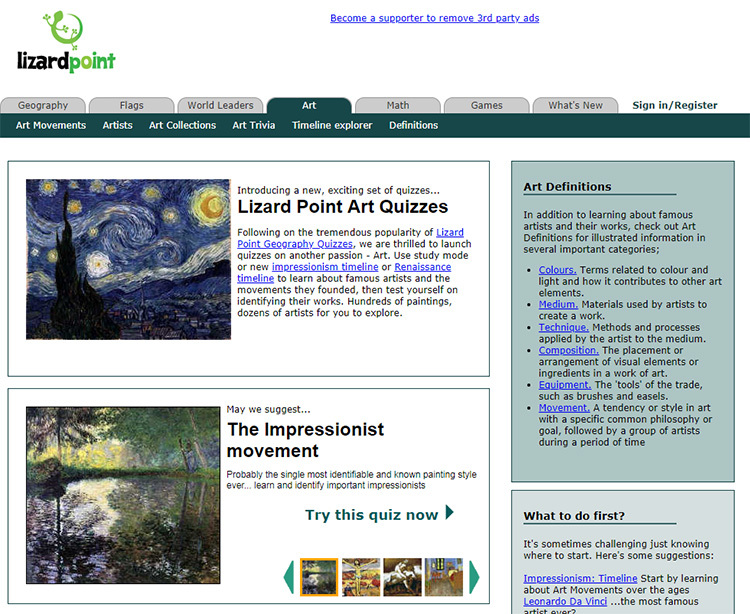 Try these out to test your knowledge about art and learn more about famous artists, works of art, art movements, the elements of art and design, and a whole lot more. Even if you decided to swear off quizzes forever, you might want to make an exception for these. They’re a great way to fill up your downtime, take a brain break from creating art, and to improve your knowledge of general art history & art related subjects. 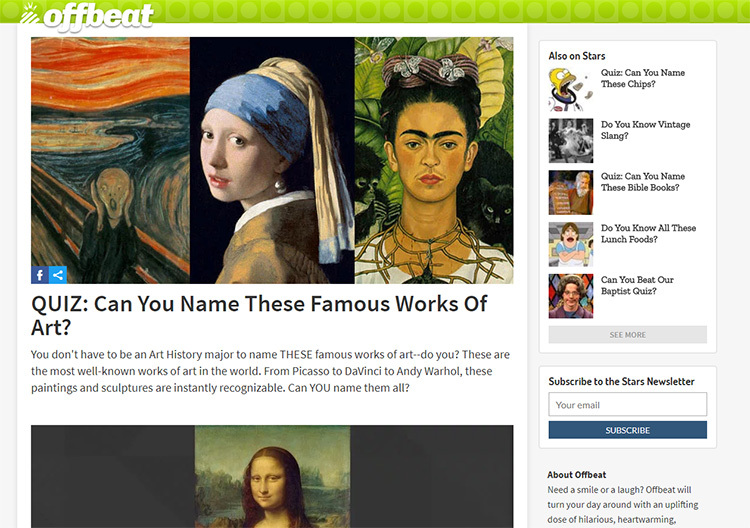 The info-tainment site Offbeat has a really neat quiz covering some famous paintings. 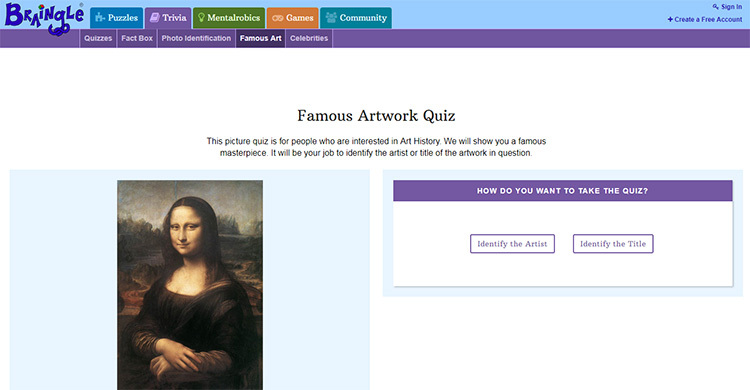 This is a simple multiple choice quiz where you name the famous works of art shown to you. If your painting knowledge is a bit rusty this is a good place to start before you move onto some of the other tougher quizzes. And if you want to have more of these paintings around the house maybe pick up an art coffee table book for your living room. This is a short multiple choice quiz on art movements, works of art, mediums, and techniques. Each question is timed with a 30 second interval clock but it resets for each new question. So don’t feel rushed as you go along! 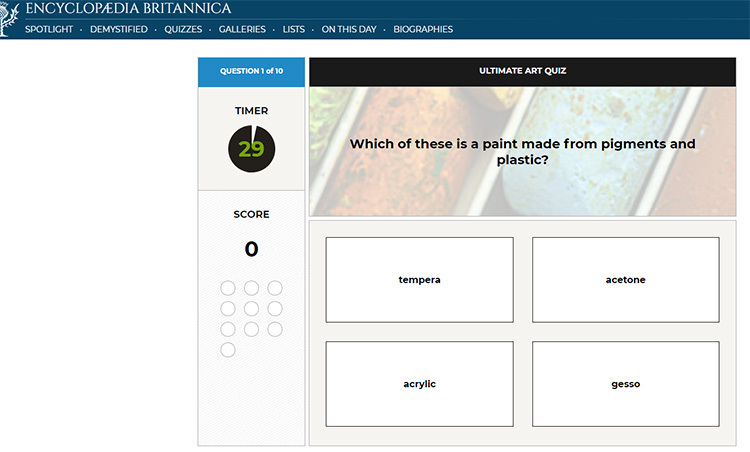 This is a good warm up for some of the other quizzes on our list since it covers a wide variety of art topics. And if you pick the wrong answer it’ll highlight the correct choice in green so you can still memories the right one. 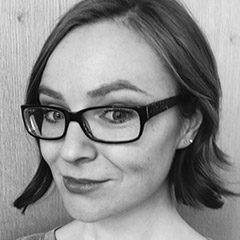 This site has tons of academic quizzes about different artists, works of art, art periods, and art techniques. Take some time to browse these quizzes and find some areas where you’d like to learn more. These quizzes have a lot of “replay value” and are actually quite addicting because you want to try again, just one more time, to get a perfect score without having to peek at the answers. Most of the quizzes give you a list of a few dozen terms about ten definitions and ask you to select the matching terms. For example, the art techniques quiz might give you the definition “highly fluid application of color,” and you could select “wash” from the list. Or it will show you ten paintings at once, then give you the title or artist and ask you to select the corresponding painting. They aren’t easy answers, either! You can try to finish the quizzes without cheating, or click the “show me” button on any quiz to see the answers on screen. This way you can study and memorize the answers for next time. It sounds like cheating but this is actually a great way to learn. It sort of feels like the flash card method for memorization. Jetpunk is another site with art quizzes that have a bit of a different structure. Choose a quiz and it will give you a bunch of pictures or a list of clues, start a timer, and ask you to start naming titles or artists that you recognize. Then see how many you can get before you run out of time. This works your brain in a different way since it’s a fun race against the clock. This style of quiz is also addicting because you’ll always want to beat your best score. If you put in some time on the Jetpunk site you’ll be able to recognize dozens of famous works by appearance, artist, and title in no time. 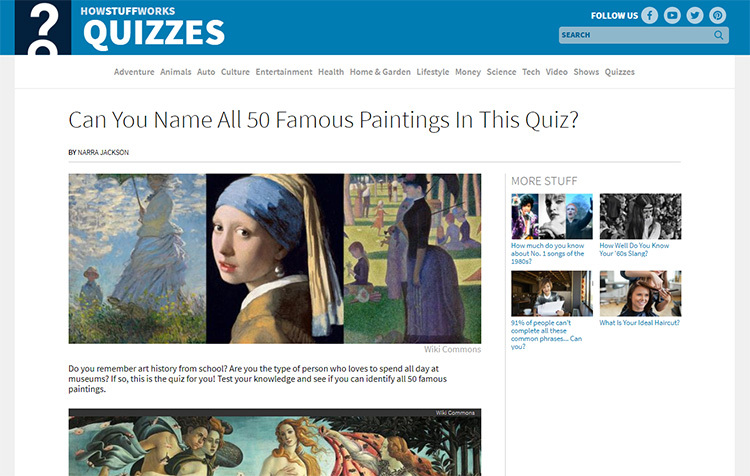 In this goldmine of a online quiz site you’ll find dozens of quizzes on famous paintings by century, topics on different art movements and their leaders, and quizzes on famous artists, museums, etc. 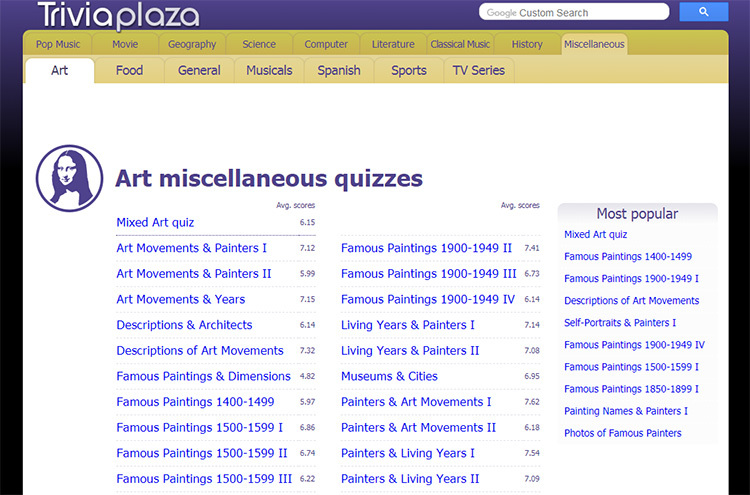 Triviaplaza offers a huge list of art quizzes that you can just browse through and click. Lots of options based on your interests. They’re all multiple choice but don’t let that fool you. These quizzes are pretty tough! You’ll definitely pick up some new knowledge about art history and become an art trivia whiz if you put in some effort here. Take some time to poke around the different quizzes and see if you can get a perfect score. The website HowStuffWorks has a great quiz on paintings that seems easy at first, but definitely increases in difficulty fast. This is a multiple choice quiz that involves naming different famous works of art. Take it a few times until you can get a perfect score! I highly recommend this quiz for anyone serious about art in general. It’s good to know the names of these pieces and memorization is a great tool to learn. 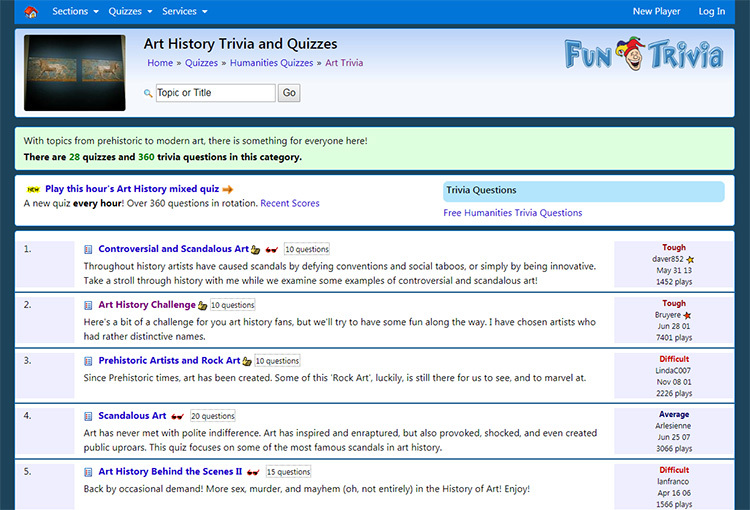 So here’s one more free site with a treasure trove of multiple choice quizzes about different eras of art, as well as quizzes with some fun themes like scandalous art, “art under attack,” and even prehistoric rock art. Check out the main page on Fun Trivia to see what you think. Each quiz topic is listed by its title and you can click through to find something you want to study. Braingle’s art quiz has a bit of a different structure. Instead of taking a series of questions and getting a score, you just select whether you want to name the artist or the title of the artwork it shows you, then it tells you if you’re right or wrong. You can answer as many or as few questions as you like and there’s no overall score. It’s really fun to see how many you can get right in a row! Plus you can also see how your answers compare to others who took the quiz. This is a great way to learn these works quickly and study some basic art history on the fly. Here’s something new: you can take this animation quiz with friends! Whaaat? Have you ever played those party games where a prompt or question is shown on the TV and everyone draws a picture or enters their answer on their phone? This quiz works a lot like that. Click this link to visit the quiz page. Then either take it online or click the mobile link, which will prompt you to enter a game code into a URL on your own phone. It will send questions to your phone so you can answer and compete, and it will keep score for you. You can learn about animation together! Granted this also works on your laptop or desktop and you can do a solo run of the quiz by yourself. So it’s got a little bit of everything for your typical animation fanatic. This is a great party game to play with your artsy friends or other animation fans. So maybe try to squeeze in a few rounds on game night between Mario Kart sessions. Or you can just dive in and try the quiz by yourself. Either way it’s a fun animation-themed quiz that’ll get your brain juices flowing. No doubt one of the best ways to learn is by playing games, and that’s basically what these quizzes are. So if you find yourself with a few spare minutes, a boring night with no plans, or if you happen to be procrastinating some work(hey, we don’t judge!) 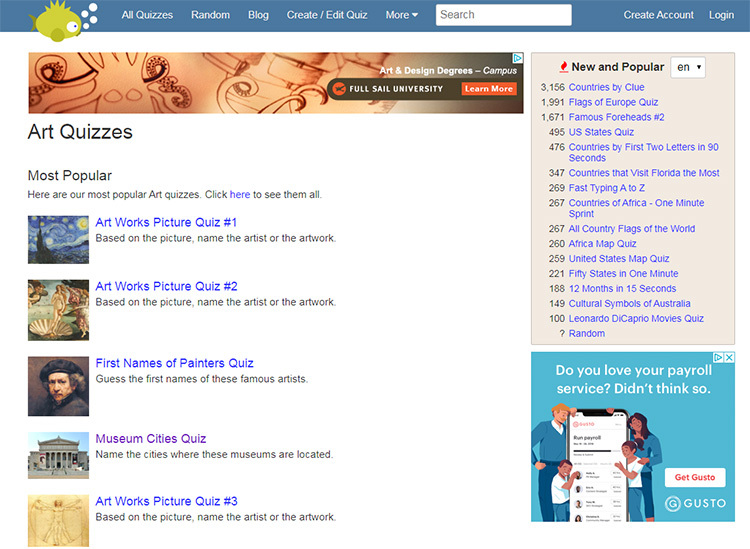 you can fill up time with some cool art quizzes to learn and have fun.